When we launched the new guidelines, I expected to lose some writers due to the greater focus on writing quality. In past weeks, that has not been the case. This week, however? It's happening, with a blessed, correlating improvement in quality. Let's get into it! Click any of the graphs for the interactive version. 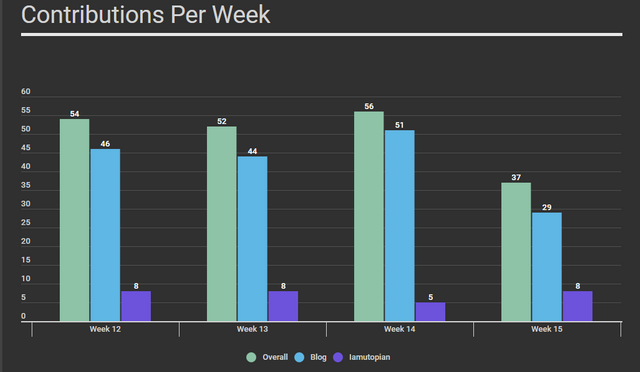 Graphs made using Airtable and Infogram. 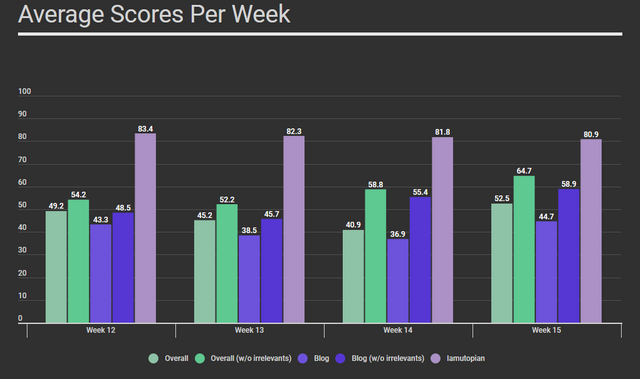 While we're still not at the scoring levels from the old questionnaire, this week saw a significant improvement in average scores. In fact, if you take away the three posts that scored under 30, we get a remarkable average of 65.3. 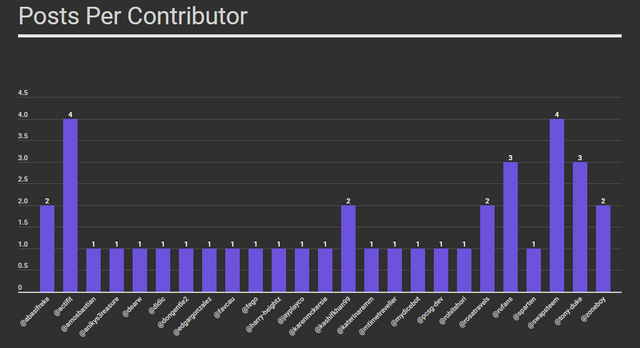 Our contributors are putting in the work to improve, and I appreciate that. 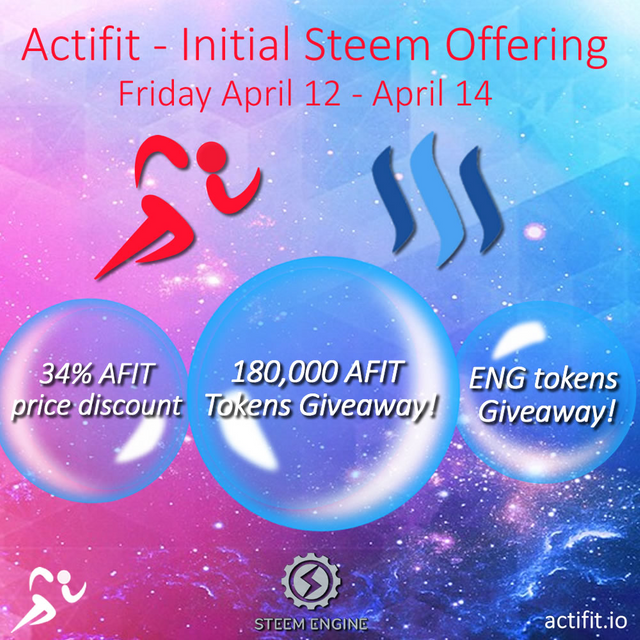 @Actifit is one of the very best dApps on Steem, as well as one of our best and most consistent contributors. Launching an Initial Steem Offering of the AFIT token is a huge deal, and the post about it is detailed and exciting. It was our staff pick this week, as well as the highest scored post. 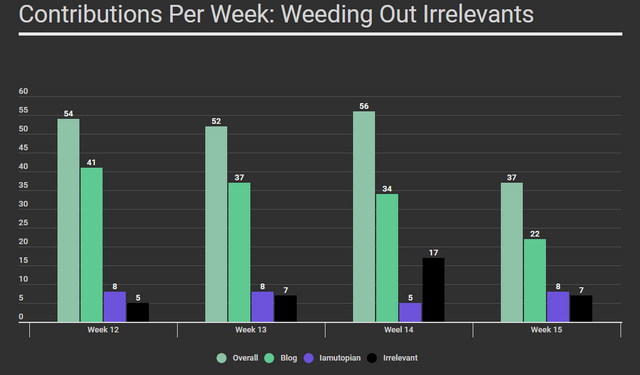 Our overall number of posts this week was the same as the number of relevant posts in the Blog category alone two weeks ago. But that's not a worrying drop, to my mind, coming as it did with a higher quality of posts. It's also not unheard of. Three months ago, this would have been a spectacular week. We've had a huge increase, and we're seeing some of that drop off with the new questionnaire and scoring. It is important to note that these are the numbers for the relevant posts only. All the irrelevants were scored zero, of course. But we've had no relevant posts scored below 27, and a nice number of reasonably scored posts. While few posts get high scores, I feel the floor is rising a bit. Last week's final thoughts are this week's new segment. This week's load of irrelevants was lighter, and also less complicated overall. Of the 7 irrelevant posts, only two required serious research work by @lordneroo, who discovered the plagiarism issue. The other five posts were easy to dismiss at a single glance, as they were in no way related to what we do here. Once again, our moderators are wonderfully in sync, doing almost the same number of reviews, with an almost identical average score. Both @lordneroo and @tykee are also active behind the scenes, talking about the posts we moderate, and any issues that arise. They are a true pleasure to work with. 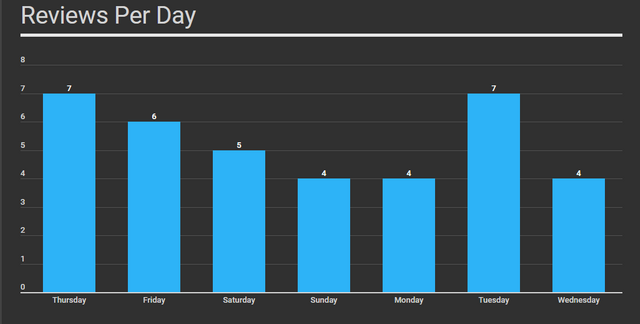 As you can see, the lesser workload was spread around fairly evenly. Finally, as usual, I'll remind you of our IndieGogo campaign. We're also on Fundition. Looking forward to your support. We need it. Have a great week, everybody, and keep blogging! Hello, @didic. 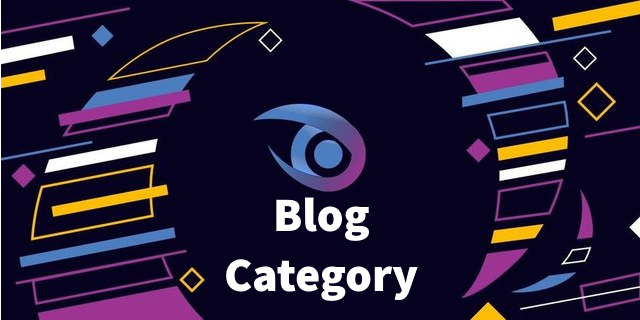 Thank you for the very brief report for the blog category. I appreciate the efforts of the moderators on the blog section. They've been indeed very helpful and are doing high-quality work. Keep it up. Thank you for your review, @knowledges! Keep up the good work! You just got a 1.71% upvote from SteemPlus! 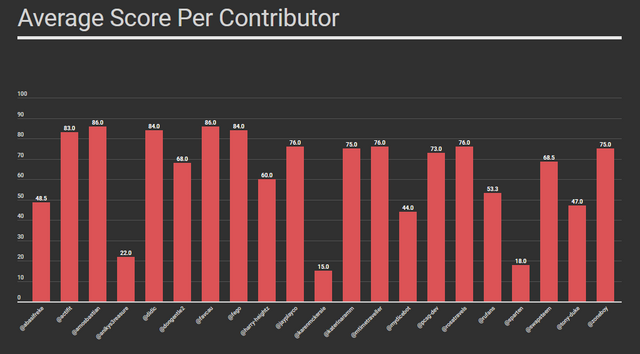 Your UA account score is currently 3.909 which ranks you at #4298 across all Steem accounts. Your rank has dropped 3 places in the last three days (old rank 4295). 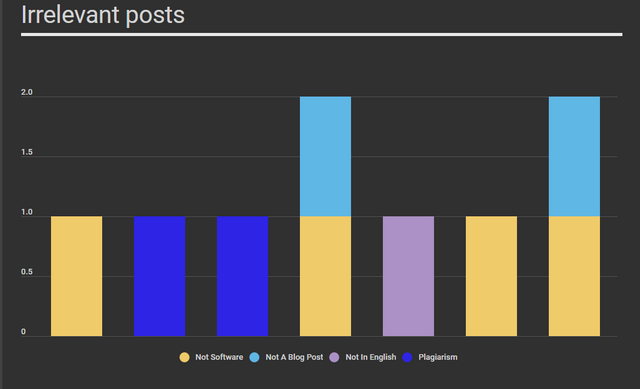 In our last Algorithmic Curation Round, consisting of 195 contributions, your post is ranked at #57. I didn't realize the guidelines had changed. I will need to revisit those and get up to speed :) Thanks for the update.